100% plagiarized text with excerpts from journals, books and websites. The table below shows an ordered list of the top 10 best plagiarism checkers in 2019. The overall score is based on plagiarism detected, usability and accuracy. Scribbr is clearly the best plagiarism checker for students. Of all the plagiarism checkers we tested, this one was most successful at detecting plagiarism. Furthermore, the plagiarism report includes a clear plagiarism percentage and a list sources that have similarities with your document. Scribbr’s plagiarism checker has the largest database of scholarly sources and is therefore capable of finding more similarities compared to other plagiarism checkers. Scribbr’s plagiarism checker can detect not only exact similarities but also patchwork plagiarism (i.e. slightly rewritten text). In addition, the technology has the options available to ignore your bibliography and properly quoted text. This results in a much more reliable plagiarism check. The plagiarism report is clear and contains all the information you need. It reports a plagiarism percentage, a list of sources and a color-coded copy of your document that highlights areas with potential plagiarism. Unfortunately, the Ephorus plagiarism checker is not available to students. The Ephorus plagiarism checker has been acquired by Turnitin. Some universities still use the Ephorus technology, but they are gradually upgrading to Turnitin. Ephorus has access to many sources and is therefore able to detect large amounts of plagiarism. The Ephorus algorithm is the second-best on the market, after Scribbr. Like Scribbr, Ephorus can detect patchwork plagiarism. The plagiarism report is detailed and easy to read, as you can see in the example above. Plagiarized sentences are highlighted, and the source is displayed in the margin. Moreover, every source is highlighted in a different color. In both documents, the Quetext plagiarism checker was able to find more plagiarized text than most other checkers. However, it detected much less plagiarism than Scribbr. If your university uses a more advanced tool, then you might be surprised by unexpected plagiarism that Quetext didn’t find. Quetext’s database is considerably smaller than that of Grammarly and Scribbr. It only checks for plagiarism against Internet sources and online books. It does not detect plagiarized text from journal articles. Unlike many other plagiarism checkers, Quetext is capable of detecting plagiarism, even if some words are changed. However, the algorithm does detect many false positives. This means that the reported plagiarism percentage is in fact much higher than it should be. The results are reported in a nice overview that includes a percentage and highlights the sentences that are matched with other sources. 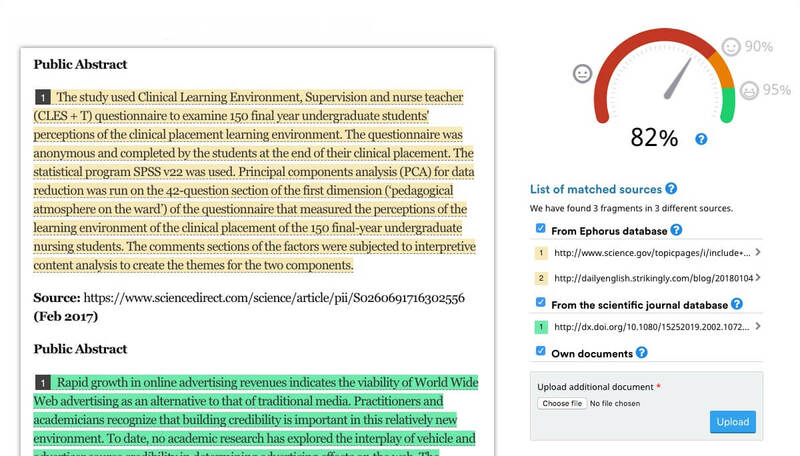 Quetext also has a built-in citation feature to help you cite plagiarized paragraphs. However, it does not report which parts of your document are plagiarized. This makes it hard to add accurate citations or rewrite your text. The Compilatio Studium plagiarism checker only compares your document against available Internet sources and its own database. It does not check your work against papers submitted by other students. The algorithm finds the right source for plagiarized text. In contrast to some other plagiarism checkers, it did not report any false positives. Unfortunately, the report is limited to a plagiarism percentage and a list of sources. An overview of where your text contains plagiarism is missing. After doing the check, you know which sources your paper matched with but not where to put the citations. Other plagiarism checkers do have this feature. The database is small, and the matching algorithm does not perform as well as other plagiarism checkers. If you’re willing to spend money on a plagiarism checker, then there are better alternatives. If you want to make use of the BibMe plagiarism checker, you’ll need to sign up for BibMe Plus. After the three-day trial, it costs $10 per month and includes five plagiarism checks per month. The database includes basically everything that is openly accessible online. BibMe is able to find the plagiarized text from journal article abstracts, but not from the content of the article. The algorithm found quite some plagiarism in Document #2 (100% plagiarized text). However, it detected very little plagiarism in Document #1 (the real paper). For students, this plagiarism checker is less suitable, as their papers often contain slightly rewritten text rather than 100% plagiarism. BibMe does not report a plagiarism percentage as other plagiarism checkers do. It only highlights the parts of the text that are plagiarized. BibMe does include some useful additional features, such as a spelling checker (which is of moderate quality) and a citing tool. Plagscan is a widely used plagiarism checker that performed well with Document #2 (100% plagiarized text). However, in Document #1 (real paper), which contained patchwork plagiarism, Plagscan did not detect much plagiarism. This shows the quality difference with, for instance, Scribbr. The downside of Plagscan is the size of its database, which is smaller than that of Scribbr, Ephorus and Grammarly. Plagscan therefore cannot detect plagiarism from certain sources. The algorithm is smart enough to flag plagiarized paragraphs with some changed words. However, the algorithm sees every sentence as separate, resulting in many separate plagiarism matches with the same source. The plagiarism report is clear and easy to use. You receive a list with all the matched sources, which are also highlighted in the document itself. In the report, the text is categorized as “exact match,” “possibly altered text” and “marked as quotation.” However, the categorization does not work perfectly. Recommended: Yes, if you’re on a budget and do not mind spending time looking into falsely marked plagiarism. The Plagramme plagiarism checker found a high percentage of plagiarism in Document #2. However, it falsely flagged a lot of words and sentences. This makes the plagiarism percentage less reliable. The pricing of the plagiarism checker is confusing. Plagramme claims to offer a free check, but in reality, it only gives you the plagiarism percentage for free. To find out which parts of the text are plagiarized, you have to buy credits. The algorithm works rather well, even when some words are changed. It does flag quite a lot of false positives. Furthermore, it does not detect all plagiarism, even if the original information comes from a source that the checker has access to. One of the shortcomings of this check is that the document doesn’t keep the original formatting (as can be seen in the screenshot). Grammarly focuses on its spelling and grammar tool and offers the plagiarism checker as an additional service. If you’re already a paying Grammarly customer, then using their plagiarism checker might be a good option. However, if you really want to identify plagiarism in your paper, then you are better off using another plagiarism checker that is capable of finding more than exact matches. The Grammarly plagiarism checker does not perform well when some words in a plagiarized paragraph are changed (patchwork plagiarism). It detected 0% plagiarism in Document #1 (a real paper), whereas other plagiarism checkers like Scribbr detected 44% plagiarism. Grammarly is easy to use. It reports a plagiarism percentage and a list of sources in which the matching text can be found. The plagiarized text is underlined in the document next to possible spelling and grammatical errors. Recommended: No, it uses a very poor algorithm, has a small database and is not user-friendly. As the name suggests, Smallseotools is a free plagiarism checker primarily meant for marketers who want to check short snippets of text for plagiarism. We only reviewed Smallseotools because a lot of students use it. Overall, this is not a good plagiarism checker for students as the results are not reliable and are very tough to analyze. Smallseotools has no specific database. This plagiarism checker enters every sentence in Google Search to see if it finds a match. When it does, it marks the sentence as plagiarized. As can be seen in the plagiarism percentage, this method is very unreliable. Smallseotools uses Google’s “exact search” to find matches. There is no database or advanced algorithm, which is reflected in the limited amount of plagiarism detected by the check. The downside of the Google Search method is that you have to find the source of the matched text in the search results by yourself. This plagiarism checker doesn’t highlight the plagiarized text in the document. It only provides you with a list of plagiarized sentences. Just like the Smallseotools plagiarism checker, Searchenginereport.net is built for businesses rather than students. The performance of these plagiarism checkers is similar. In Document #2 (100% plagiarized text), the checker did detect plagiarism, but it did not detect plagiarism in the real paper. This plagiarism checker only compares your document against sources available on the Internet. The algorithm is poor. It finds exact matches but is unable to detect plagiarism when some words are changed. Furthermore, the algorithm analyzes every sentence individually instead of analyzing the paragraph as a whole. The report only shows a list of sentences that are possibly plagiarized. When checking a larger document, this can be confusing because every sentence is shown separately. If you want to find the source of the plagiarized text, then you are redirected to Google’s exact search. Edubirdie’s plagiarism checker is of very poor quality. It found much less plagiarism compared to other checkers. Its database is rather small, and the algorithm only checks for exact matches. Edubirdie only checks against major Internet sources. Plagiarized text from small websites is not detected. The algorithm is really poor. It only finds exact matches. When a few words are changed, it does not detect any plagiarism. Furthermore, Edubirdie marks some parts of the text as plagiarism even when they aren’t plagiarized. The window that displays the plagiarism check results is small and fairly useless for students with a large document. You can only see four to six sentences at a time. Is it plagiarism if you cite the source? What is the difference between plagiarism and paraphrasing? Can you use Turnitin for free? Are there also free plagiarism checkers?